Twice this past week, we have had a rare occurrence in Southern California: rainstorms! Living in a desert where rain occurs seldomly, it has definitely gotten residents excited to have the rare, beautiful experience of rain. With the rain rolling in, my family and I decided to venture to Disneyland! As we were walking in, we were met with swarms of crowds walking AWAY from the parks! Many people avoid Disneyland when it rains, but in my opinion, it makes the happiest place on earth a bit happier. With this post, you can learn how to make going to Disneyland in the rain an enjoyable experience. And if you’re planning a vacation to the parks, and want to pack to be prepared for the rain without having bulky suitcases, you can take my advice in what to pack to have everything you need if you get caught in the rain! The Mommy Hook: I use the Mommy Hook on my stroller when I bring one, or if you are strollerless you can hook the Mommy Hook onto your backpack (it’s like a giant carabiner clip). On my Mommy Hook, I like to hang a bottle of water. I like to have a bottle of water available on hand in the rain, since restaurants are typically very crowded when raining. I don’t want to have to wait in large, crowded lines to get a cup of water, so instead you can have your bottle on a Mommy Hook. Another important aspect of the Mommy Hook for the rain is to hang your umbrellas from. When you’re not using your umbrellas, they can hang from the Mommy Hook to dry. Most stores will offer plastic bags to guests in the rain to put their umbrellas in. You can tie your plastic bag around your umbrella and then hang from the Mommy Hook. A lunch box: I like to bring my own lunch box when raining (or just snacks in general) so that if I’m starving I can maybe skip restaurants while it’s raining (again, to avoid the crazy outdoor crowds). Poncho or waterproof jacket: Since California can get rainy, but rarely cold, a lightweight waterproof jacket is sufficient. No reason to waste backpack room or suitcase room with a big puffy jacket. If you want something more disposable or if it’s humid out, the Dollar Tree and similar stores sell ponchos (2 for $1). Stroller cover: I love having a stroller cover, so I don’t have a sopping wet stroller or cup holders filling up with water during the rain. Layers: Again, since California rarely gets cold, don’t bother packing big boots or long-sleeved shirts. Whenever I think it’s a good idea to go to Disneyland dressed that way in the rain, I soon regret it. The sun pops in frequently, quickly making you feel overheated. My go to are pants, ankle boots (not too hot, but still good for rain puddles), short sleeve shirt, and a lightweight waterproof jacket or poncho. Umbrella: Chances are you will want to snap photos in the rain, so I highly recommend bringing an umbrella, not only for coverage but so you can use your camera or phone without it getting wet. Disneyland is gorgeous in the rain, so trust me, you don’t want to forget it! I always can’t believe when I see tons of people leaving the parks in the rain! Don’t they know it’s the best time to be at Disney? Shorter ride lines: Most ride lines are much, much shorter. Especially ones with outdoor que lines. Easy to park: Since there’s less people, that also means less people in the parking structure. Often times there’s no line to enter the structure, and many times I’ve gone in the rain I’ve gotten to park on the ground level of the Mickey & Friends Parking Structure. Photo Opps: Overcast weather is the best weather for taking photos, meaning you will get the most stunning Disneyland pictures; rich colors, fewer people, no shadows. Character Meet & Greets: The characters you usually see on Main Street do meet & greets in The Main Street Opera House. A lot of people don’t realize Goofy, Mickey, Minnie, Pluto, and even sometimes some princesses are there in the rain, so there are hardly any lines to see them. Just yesterday, my daughter saw Snow White, Ariel, Belle, Goofy, and Minnie all within 15 minutes! Rainy Day Cavalcade: Since it is unsafe for parade floats to move in the rain, there is the Rainy Day Cavalcade instead! The Cavalcade has some favorite Disney characters riding the double=decker street car, waving to guests as they pass by. It’s a fun way to see a lot of characters quickly! Avoid indoor areas: They tend to be very crowded, hot, and full of dripping wet umbrellas! If you really want to take cover indoors, my favorite place to do so is The Main Street Opera House since it is a wide open space. But aside from that, enjoy the short ride lines and the beautiful scenery. Be Prepared: Pack the right clothes, the right tools, and you won’t have a problem if rain hits. Embrace it! 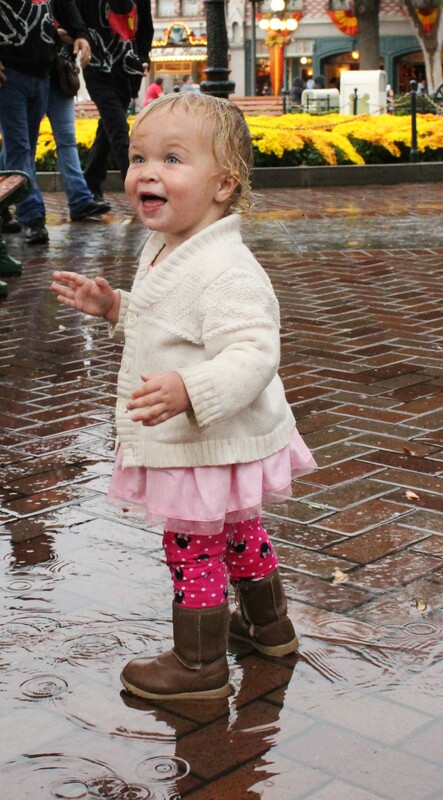 : Rather than trying to stay dry, channel your inner child, and enjoy the rain puddles…as the Newsies would say, ceize the day!